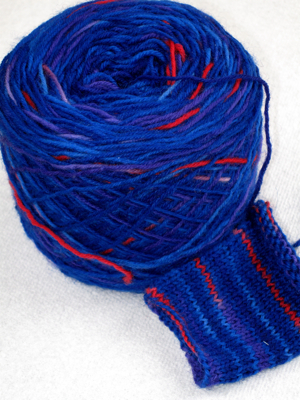 The base color is blue with sections of purple and just enough red to leave a bit of bright color here and there. It took a lot of dye and much poking and prodding to get good solid colors but I’m very happy with the results. It’s a superwash wool, which I normally don’t like, but I also don’t like washing socks by hand. All reports are this yarn wears well so I may try this again. Posted by feorlen on 4 May 2009 at 6:51 pm under dyeing, knitting. Another thing I did while I was on vacation was color my hair. I had used henna before, a plant that produces a red dye, but only by itself. The instructions I have recommend combining it with indigo to get browns instead. I wrote up a quick page about it with some pictures. Posted by feorlen on 15 June 2008 at 7:56 pm under dyeing. I spent most of the day with the drum carder. Last week I pulled out several small bags of fleece to blend together and this morning decided I didn’t have enough. So out comes the collection of workshop samples and other odds and ends and between all the different kinds of silk I have enough to do something. Gold tussah, bleached tussah, bombyx multiple sources and a few wool/silk blends. 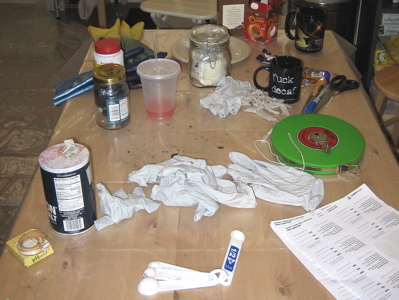 I left some of the larger amounts for another project and took all the bits and stuck them in some blue dye. While the color was steam-setting (three hours!) I started preparing the base fiber. I set aside the lightest color wool to blend with the silk. The wool was all combed out in the staple with a dog brush and then carded, the wool blend took three passes and the silk five (because it was all clumped together after being dyed.) 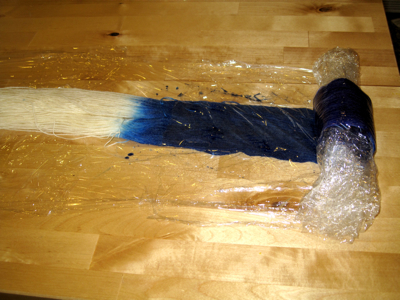 Now the gray-brown and blue batts are ready, tomorrow I just have to do the final layered blend of the two. There is probably about 200g of fiber, enough for socks and a hat or a large scarf. I’m thinking I’ll do 3-ply sock yarn and then see what I feel like making. The yarn should come out a tweedy blue-gray. I’ll have pictures later. Posted by feorlen on 22 March 2008 at 9:29 pm under dyeing, spinning. It’s hard to get a good picture of sheer fabric, particularly when the room with good lighting has a striped sheet on the bed. But there it is. I gathered the fabric along both selvedges and then bunched it up and tied it with rubber bands, kinda like one of those old broomstick skirts. The folds of fabric all crammed together made the dye take unevenly and the rubber bands made white stripes where it kept out most of it out. Indigo isn’t very energetic when it comes to working around resists, like some other dyes that will wick under ties to color the fabric. No, I have no idea what I am going to do with it. I got a bolt of the stuff on sale a while back and I’m mostly just playing with it. I typically make clothing from soft fabrics that drape well and organza is stiff no matter what you to it. It would make an interesting sheer layer over something else. Posted by feorlen on 6 January 2008 at 10:14 am under dyeing, sewing. I had this week off, so some friends came over again. We made things blue. I gathered and tied about 5 meters of silk organza, which I’ll get a picture of later. I just washed it this morning. It was instant indigo, which is far less complicated than a traditional fermentation vat. I’ve done the whole big deal (with and without the stale urine part) and while that is technically interesting, I’m not going to do it in my kitchen in an afternoon. Posted by feorlen on 5 January 2008 at 6:41 pm under dyeing.